Choose a LawnBott model from the selection below to match your needs. If you have any questions, please feel free to contact us. We have over ten years of experience with robotic lawn mowers so we can usually answer your questions right on the spot. 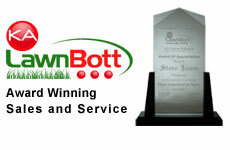 A Lawnbott can take care of up to a 1 3/4 acres of lawn. Multiple units can be run to take care of even higher acreage requirements. Questions? Give us a call at 1-866-392-3766 - Press "1" for Sales.